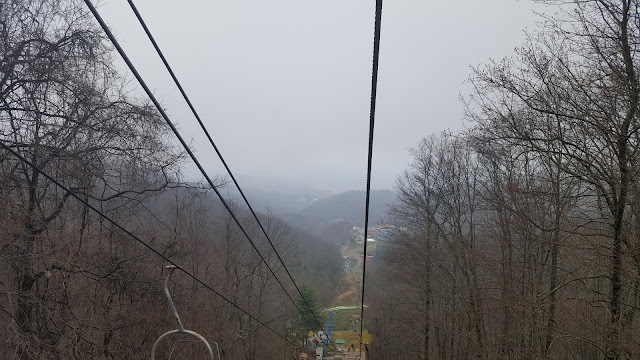 Ober Gatlinburg is an amusement park and ski area, located in the Smoky Mountains overlooking Gatlinburg, Tennessee. It offers a mall, ice skating rink, a snack bar, a lounge, a video arcade, a full service restaurant and various gift and clothing stores. Outside, you'll find a number of cool amusements like an Alpine Slide, ski slopes, a black bear habitat, a mountain coaster and tubing slides. In order to get to Ober Gatlinburg, you've got to drive through the downtown Gatlinburg strip and take their aerial tram up the mountain. The tram ride itself is a bit unnerving for a guy like me who is afraid of heights. It's especially unnerving when the tram passes by another tram going the opposite way and they both shake a bit. But, it's all in my head, as aerial trams are incredibly safe. Once we got up the mountain, we poked around the mall area and checked out the things to do inside. I was actually impressed that the snacks and drinks (especially beer) were reasonably priced for an amusement area. Their Reuben is actually pretty tasty. We eventually went outside and got on the chair lift that brings you to the top of Mount Harrison. Again, being afraid of heights, this was a particularly nervous trip for me at the beginning, but I calmed down pretty quickly. Halfway up the mountain is the drop-off for the Alpine Slide where you can get on a handbrake-enabled cart and slide down the mountain. If you elect to keep going up the mountain, you'll reach the top in about 15 min from that point. At some point, you'll have your picture taken by an automatic camera. There wasn't much of a view when we went up due to the weather rolling in. But, it's still nice up there. Heading down via the chair lift was a lot less nerve wracking than heading up. The ride put me at ease enough to head back up again, this time to stop mid-way and dart down the mountain via the Alpine Slide. Those things can really get moving, especially around the corners. The rest of the family went on the famous Ober Gatlinburg Mountain Coaster while I stayed behind to watch the little one. There was a pretty long wait for them to go, but I'm told that they thought it was worth it. I could tell by the look on their faces in the pictures that the auto-camera took of them. Which brings me to another point: The folks at Ober Gatlinburg are pretty snap happy. You get your picture taken coming off the aero-tram, going up the chair lift, riding the mountain coaster and sliding down the tubing hill. At about 10 bucks a pop multiplied by several family members each, it got to be pretty pricey. The folks at Ober Gatlinburg call it "memory insurance". Your wallet may have another word for it.